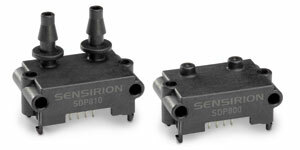 Sensirion, the world’s leading manufacturer of high-quality environmental and flow sensors, presents new product variants of the SDP800 differential pressure sensor series. The SDP801-500Pa and SDP811-500Pa complement the product portfolio with an additional I2C address that enables the connection of two sensors to the same I2C bus. The SDP800 series are the perfect fit for the most demanding yet cost-sensitive applications like water heaters, burners, VAV cotrollers and medical respiratory applications. The SDP800 sensors offer excellent repeatability and a measurement speed of up to 2 kHz. The fully calibrated and tempera-ture-compensated sensors are available in versions that differ in pressure range, pneumatic connection, output signal, and now also different I2C addresses. Visit Sensirion at the electronica in Munich from November 13 to 16, 2018 in Hall B3, Booth 417 and learn more about the new differential pressure sensor versions of the SDP800 series. For more information about our products, please visit us at www.sensirion.com/sdp800.